It’s not your imagination — crosswalks around San Francisco are being upgraded more rapidly to the “continental” striping style, also known as “ladder” or “zebra-striped” crosswalks, to make people more visible to drivers when they’re crossing the street. The SFMTA has ditched its traditional crosswalk design comprised of two white lines along the length of a crosswalk, since studies from the Federal Highway Administration have shown continental stripes are much more effective at getting drivers to yield the right-of-way, said Ben Jose, spokesperson for the SFMTA’s Livable Streets subdivision. As a reminder, 964 pedestrians were injured on SF streets last year. This year, 12 have been killed. In 2011, motorists’ failure to yield to a pedestrian in a crosswalk was the most-cited cause of pedestrian injury, comprising 40 percent of cases, according to the SFMTA’s 2010-2011 Collisions Report [PDF]. I wish Patxi’s drivers would stop blocking the crosswalk / curb-cut in this intersection. Thank you so much for your feedback! I’m so sorry that our driver’s have caused you any inconvenience. We have started having them wait for their orders on 10th Avenue and this should hopefully stop any hazards that cyclists in the neighborhood are enduring. I will work with my whole team on making sure this happens. I grew up in Europe and “Zebra crossing” was so tightly ingrained in the vocabulary that it amazed me that there isn’t even an agreed upon name for it in the US. BTW, this article is very timely, since yesterday was the 62 birthday of the Zebra crossing (here is an article from 2 years ago showing the birthday was October 31, 1951, in the UK: http://metro.co.uk/2011/10/31/zebra-crossing-marks-60-years-on-uk-roads-but-it-could-be-facing-extinction-202683/). Ah, and now it’s better!… sort of (I just took this photo). This is the same thing the Pasquale’s drivers do on 8th Ave. A lesser evil, I suppose… if they’re going to be on 10th, I’d rather see them double park than do this. 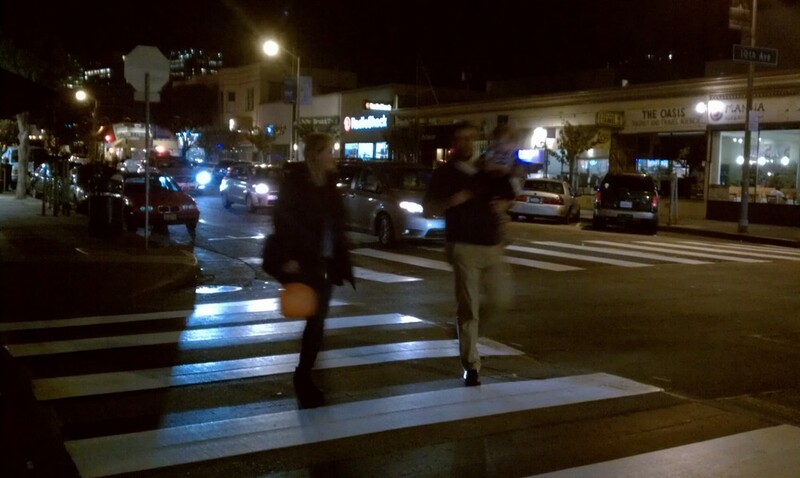 while SF is putting these type of crosswalks in, Berkeley has been implementing a different kind. is there something that Berkeley sees that is more beneficial with this new type of crosswalk or is it just experimental? I’ve been wanting to contact North Beach Pizza about their drivers for years. Maybe I should finally get on that. Do you know what they’re turning Park’s into? NB – Possible ROFL trigger at the nether end of the second link. P.S. The image below goes with the first link (credit : SWNS). Suggest they deliver pizzas by bike. Tony’s Pizza Napoletana in North Beach delivers by custom electric bike, and it’s great advertising for them. Astonishing to see the guy riding the thing up Russian Hill. I checked in with Berkeley’s bike/ped coordinator a while ago on this and the design was a recommendation from the city’s ADA coordinator. By removing the middle, the ridges from the thermoplastic no longer cause jarring to people with disabilities (particularly those with spinal issues). This design can also be seen all over downtown Sacramento. Ah, I had been wondering about those! if berkeley was copying sacramento for some reason.. like to save a little money on paint. what are those crosswalks called?